My Ocean Kayak Sprinter is shaped like a needle, and it's fast! It's all fiberglass, so I don't worry too much about scratching it. I enjoy sailing my Klepper foldable kayak. 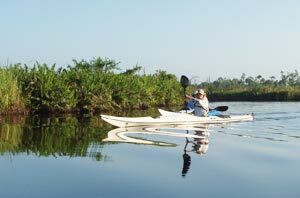 My place near Punta Gorda, FL sits on Shell Creek, a tributary of the Peace River just above Charlotte Harbor. It's small boat paradise, right at the vague boundary that separates fresh water from salt. Just downstream are mangrove trees, and just upstream are cypress swamps. My father had a very nice fiberglass and wood canoe from the Stowe Canoe Company, and a pair of nice wooden canoe paddles. I enjoyed paddling around in the creek, and got pretty good at solo canoe paddling techniques like the J-stroke. Still, I found the canoe slow and prone to being blown about by the wind. Once, I almost got blown into the downstream side of the dam which is just up the creek from my house. I was paddling along the length of the dam, and the wind came up very strong, blowing the bow of the canoe down toward the dam. I paddled hard, trying to get the bow to turn back into the wind, but wound up accelerating toward the dam! I managed to pull out of it before getting blown down into the flow of water coming over the dam, but it was close. My dad's canoe was very nice — too nice to just leave down by the creek. Back in Miami, I would have been worried about thieves, but here in Punta Gorda I was more concerned about the effects of leaving the canoe outside. If I put the boat under the house, it was well protected from the elements, but a pain to get down to the creek by myself. I decided I needed a kayak. I liked the fact that I could carry a passenger in the canoe, or go alone, and at a kayak shop down in Fort Myers, I found the boat of my dreams. It was an Ocean Kayak Malibu II, a plastic sit on top kayak with molded seats and footrests to accomodate 1, 2, or even 3 passengers. It was nice and wide, and not terribly heavy. I could use it by myself easily, and it was more impervious to the elements than dad's canoe. I wouldn't need a second kayak just to carry friends. Also, I knew kayaks were faster than canoes, so I could explore further in the same amount of time. Well, the Malibu II is indeed a versatile and stable kayak, and I still have it, but it turned out not to be the boat of my dreams. I learned that all that wonderful width made the boat slow. Very slow. It's no faster than a canoe, and doesn't glide at all when you quit paddling. I liked the sit on top and was happy with the Ocean Kayak brand, so I went back and bought an Ocean Kayak Scupper Pro. It was OK, but not much faster than the Malibu II. I brought it back to trade in the next day, and told the lady I wanted something fast. She showed me an Ocean Kayak Sprinter. It's shaped like a needle, about 17 feet long, but only about 20 inches wide. This particular one was used in their rental service, and she offered me a good deal, so I took it. Whoa, is that thing tippy! Almost everyone who has ever tried to use it has flipped it. I have not, and I love the boat. It's fast, it has a nice glide when you stop paddling, it's comfortable with the snap in kayak seat, and if I put one more scratch on it, who cares? I have had it for years, and it remains one of my favorite boats. Meanwhile, a friend of mine acquired a Current Designs "Solstice" built by Wilderness Systems. It's a traditional sit inside Eskimo-style sea kayak, but built with lightweight, modern materials. It also has a nice carbon fiber kayak paddle. It looks absolutely great as it cuts through the water, and has good performance characteristics which you look for in a sea kayak. It tends to round into the wind (which would have been extremely nice that day in the canoe), and it responds well to leaning the boat over in one direction, turning nicely in the other direction. It also has a flip-down rudder. I only use the rudder in the upper creeks, where there are numerous tight turns and constantly leaning the boat one way or the other and doing sweep strokes with the paddle becomes tiresome. The boat is very stable once you get inside; while a few novices have flipped it, it was always while trying to get in or out. That boat lives here at my place, and although I like the way it paddles better than the Ocean Kayak Sprinter, I don't use it very often. The seat is not as comfortable, and my heels become uncomfortable sitting on the hull inside. I can't bend and then straighten my legs every so often. After about an hour, I just want to get out of the boat because I'm too uncomfortable. The limit is about 3 hours with my Sprinter. Also, cleaning out the cockpit and getting all the water out of the boat is time consuming, and I don't want to put my buddy's boat away dirty. I just squirt off the Sprinter and throw it up on a rack. There was also a surf ski here for a while, belonging to the same friend. What a ridiculous boat! It was extremely fast and extremely tippy. I liked it for about 10 minutes at a time. The most fun I ever had with it was torturing a novice kayaker by using it to introduce him to kayaking. He flipped about 30 or 40 times on the way up the creek, and then felt like he was on a battleship when I finally gave him the Sprinter. Most novices can't sit still in the Sprinter at all, but after learning on a surf ski, he sat there like a rock. I'm not recommending this instructional technique for new kayakers. My friend and I were just being mean, torturing our buddy for the heck of it. It happened to work out because this particular guy is very good natured and will keep trying after flipping for the 30th time with us laughing at him in the gator filled creek. My friend eventually traded that surf ski for a couple of one person sit on tops. My foldable Klepper kayak is great for traveling. It disassembles and packs into a couple of large bags. By now I had a pretty good range of kayaks: The big fat slow one, the long skinny fast one, the traditional Eskimo one, a couple of spare boats for guests, and paddles for all. The one thing I didn't have was a kayak that was easy to transport. 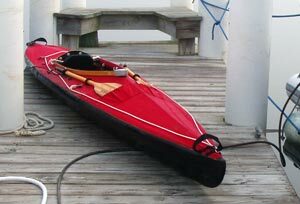 Reading on the net, I heard about folding kayaks, and started researching them. 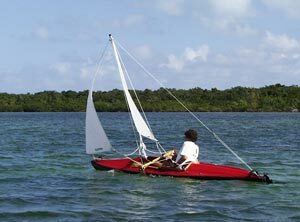 I came across the idea of sailing kayaks, and various ways to modify kayaks to put on a sailing rig. I was intrigued by the ones that use windsurfer sails and a pair of pontoons, but that stuff gets bulky. 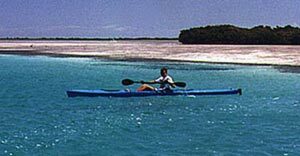 I had managed to transport my Ocean Kayak to Bimini, and was interested in the folding kayaks because I could take one anywhere. Then I came across the Klepper folding kayaks. The Klepper Aerius Expedition was everything I wanted, and could be ordered with a sail and leeboard kit from the factory and a rudder. Since buying it in 1997, I have taken it all over southwest florida, raced it in kayak regattas, sailed it in Charlotte Harbor, and even flown with it to the Bahamas. I love being able to pack the whole thing into a couple of bags and throw it in the back seat of my truck when I go places. It takes me about 20-30 minutes to assemble the boat, and maybe 15 more if I'm putting on the rudder, leeboards, and sails. I seldom use the rudder, and use the sails only very rarely.